These days we expect a modern day smartphone to be capable out of the box and expendable with a wide range of third party applications that utilize that various bits of hardware that are fast becoming standard on many phones. A jack of all trades if you will but a master of all. A category of apps that is very popular is the fitness app category, particularly the distance tracking apps. With basic usage these apps function as digital log books but with automatic data collection and output analysis. Delve deeper however and by simply using the built in GPS reciever and accelerometer, these apps can provide the user with an astounding level of output and analysis that even a coach might struggle to replicate. Of course that is all up to the user, how much of this data the pay attention to, and what they want to do with it. Since early 2010, I have been using Sports Tracker, first a Nokia Beta Labs project, then successfully spun off into a self-sufficient service under the auspices of Sports Tracking Technologies. It is now truly cross platform, adding Android, iOS, MeeGo/Harmattan and Windows Phone. The very useful mobile client is backed up by a very pleasing, albeit entirely flash based web portal, that takes the analytical capabilities of the mobile client even further. Sports Tracker is not alone in this field. There are a number of other apps that offer a similar service, in all cases bringing something different to the party. 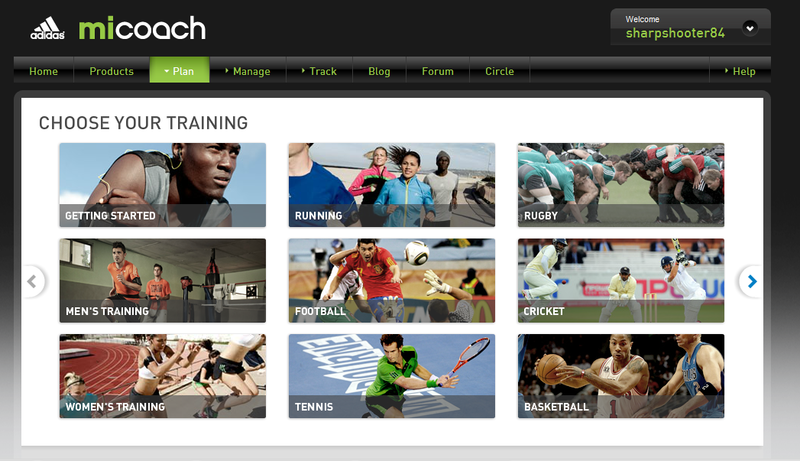 While looking for training solutions last year to improve my race times, I stumbled upon miCoach, developed by Adidas. Adidas miCoach is an extensive system that works either via a mobile client or a shoe and podometer system that is tied together by a very extensive web portal. The key to miCoach is that it offers virtual coaching, and with Adidas’ sports heritage in mind, covers a breadth of disciplines, as well as strength and cardio based exercises. These two apps have formed the foundation of my digital based training and for personal reasons I use both. Lately however I have felt the need to not only branch out, but also to streamline. I have to say; maintaining two services that for all intent and purposes achieve the same thing is a little tiresome. Thankfully there are other players in the scene. The key for me is cross platform compatibility. To my trusted two I have added Endomondo, an old hand actually, one that I dabbled with briefly in the S60 days and RunKeeper. I used the apps side by side for a week on my training routine. I am a runner so my results might not be appropriate for some disciplines but the line of thinking probably is. I run four times a week, with a cross training session thrown in to the mix. Virtually all of my runs are on the road, a mix of interval, tempo and long distance running balanced by ‘easy’ recovery runs. I do the traditional interval training, in the form of 800m repeats on the track, with fartleks and tempo running done on the road. What makes a great sports tracking app? First, I want a comprehensive but not bloated app that can function independently of a web portal. Particularly important is ease of use. I don’t want a fiddly UI when starting and ending workouts. The on-board analysis has to be decent. Immediately after a workout I want to be able to get some vital statistics quickly. Second, I would like compatibility with heart rate monitors and third, some extra functionality beyond just clocking the miles to speak. The service that balances this triad of expectations will be the service that wins out. My training is captured primarily with the Nokia N8 and on the rare occasions an Android device, currently the HTC Desire S. This is a personal preference because I feel the hardware on the N8 is better suited to this than other devices I have used. I have tried doing my exercise with the E7, N79, N9 and the Samsung Galaxy SII and all were lacking in various aspects. This does mean my experience of the apps will be predominantly Symbian biased but where appropriate, I have looked at the Android equivalents at least from a usability perspective to balance this out. Before I carry on, I have two give special thanks to two good friends Simon Thome and Quintin van Wyngaardt, fellow geeks and sports trackers, whose backgrounds in programming as embedded software engineers meant they know far more about this sort of thing than I do. I pitched the concept to them and their eagerness at times overwhelmed me, but back and forth discussions, dissection and interpretation of raw data and general advice from them certainly helped in understanding and compiling this rather lengthy guide and review piece. Something that I have always wondered about GPS based apps is how they work and how accurate they are. I have noticed device to device variation and that is normal I would think unless all companies sourced the same components. While using Sports Tracker and miCoach in tandem on the same device though I have noticed variation on the same workout between the two apps. Even when taking into account that I might stop and start the workout at different points that will amount to 5 metres at the most. But here I am seeing 50 to 100 to 200m differences in the Added to that there is a difference in the distance when I’m running races or routes marked by my club, and there is no consistency about whether the GPS measured routes are longer or shorter. I became consciously aware of this while running a 10km race back in February and as the race progressed I was alarmed at how voice feedback coming every kilometre was deviating more and more from official markings as the race progressed. miCoach announced the 10km split even before I had hit the grass embankment leading to the end and I crossed the finish line 1:50s later. I looked at the routes that both apps gave and I was surprised initially to find that step for step, turn by turn they matched up. This actually makes perfect sense as the apps are receiving the same GPS data from the phone so there are clearly difference downstream in how the data is processed. Added to that when setting up this exercisise, I imported all of my 2012 workouts, feeding the same GPX files from Sports Tracker into Endomondo and RunKeeper and lo and behold the splits, average time and total speed varied from service to service. And now we need to briefly get a little bit more technical. GPS is an acronym for Global Positioning System and refers to a network of satellites that provide accurate geolocation information applicable to mapping and tracking. Devices that we use daily, our phones and navigation unites like Garmins are GPS receivers. The accuracy of the signal the receiver gets is affected by many factors but ultimately boils down to how many satellites in the GPS network the device can see at any given time. This is affected by the quality of the GPS chip in the device and environmental conditions as well as physical obstacles like trees and houses. Also important to consider is where the device is kept during the workout. I keep mine either in a back pocket with my shorts, a pouch or an arm band initially designed for the N79. The best place is one that provides the clearest view of the sky. When tracking, the GPS chip provides the app with many many data points. The receiver in the phone receives perfectly timed signals from satellites. The location of each satellite is known and the time it takes to receive the signal is used to determine how far away the satellite is from the receiver. Triangulation can them be used to determine where the receiver is on the surface of the earth. The more satellites that are visible, the more accurate this measurement is. The receiver then reports this as geodetic data, which contains latitude and longitude points, an elevation point as well as a time stanp for when the data point was received. 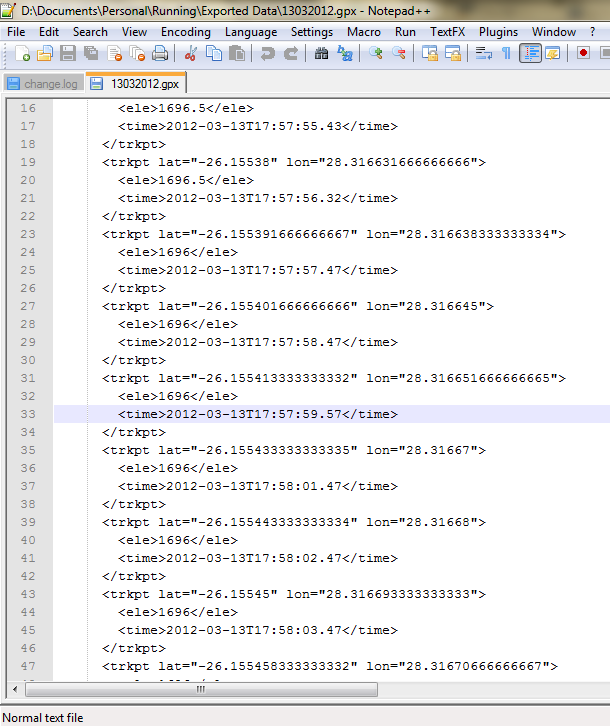 The image below is a snapshot of the data being delivered to a tracking app by a GPS receiver from a .gpx file viewed in a simple text editor. The snapshot below covers approximately eight seconds with nine points. Over the course of in this case 42 minutes, that will amount to a lot of data points. What happens next is vitally important. The application receiving the data needs to essentially play connect the dots, doing it as quickly and accurately as possibly without burning processing power. It is not enough to just linearize the points because the earth is not flat. To complicate matters further, it is not a perfect sphere but even more tricky an imperfect ellipsoid. What we see when we look at the output on a map is a flat display, pleasing to the eye and easy to interpret but which doesn’t show the full story. One needs to place each geocordinate point in three dimensional space representative of the imperfect ellipsoid that is the earth. Going from Point A to B on this three dimensional ellipsoid, both the lateral distance and the elevation have to be taken into account, as well as accounting for the curvature of thesurface to determine how far you have gone. One metre as the crow flies is different when ascending or descending compared to when travelling on a perfectly flat surface. Adding to the complexity of all, the motion of a walker, a runner or a cyclist is very different. Add in crazy sports like skiing for example and far more intelligence under the hood is required. The brains behind these apps need to put all these variations together into an algorithm that can sort through the GPS data, employing a filtering system where necessary to filter out rubbish points from good points, while taking into account what kind of activity you are doing, all in real time to be able to give you implicit on the go information either with visual or audio cues. So when selecting a workout type you are essentially selecting a computational model that takes into account all of the variables that needed to be sorted to determine how far you have tracked. Each app will have its own way of doing this and it now becomes clearer why the different apps produce variable results. The following selection of sports tracking services is not comprehensive but what all the services share is cross compatibility. Between the four apps I have selected here pretty much all mobile platform, webOS excepted, are covered. I have used these as a runner but all support a wide range of activities, running, walking, cycling and some unusual ones like nordic skiing, rowing and many more. It’s worth going to each service’s site to have a look at the range of activities, too numerous to list here. The Sports Tracker app has been around for a long time. On Symbian this is pretty clear with an interface that I am not particularly drawn to but on other platforms I have used it on, Android and MeeGo, the UI is refreshed and is significantly easier on the eye and the fingers. Much of the information presented is the same however. The landing page gives an overview with access to a diary of saved workout, the latest workout with a summary, and links to settings and the Sports Tracker online store. Something I like is the Sunrise/Sunset indicator. Starting a new workout is a simple as tapping ‘New Workout’ and choosing the workout type. 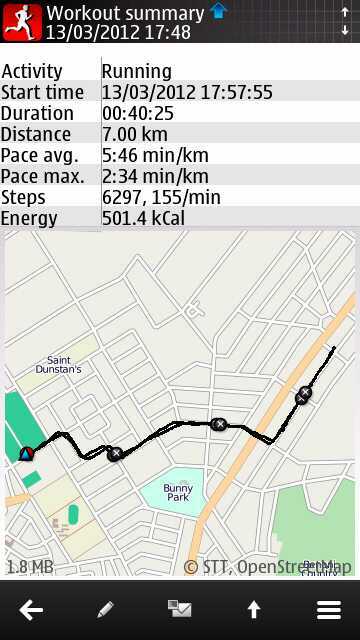 On Symbian you set the auto-lap feature here which can be 500m or 1km. On Android the auto-lap is set to 1 km and can be changed during the workout . The in-workout display is class leading I feel. You can pretty much access every type of display full screen by swipe gestures, side swiping on Android, up or down on Symbian to view detailed charts showing altitude, distance, heart rate and pace. The default display itself has all this information (except altitude) synthesised nicely. On the Android app you can also lock the in-work display to avoid pressing buttons accidentally which is a good feature to have. This information is of course displayed after your workout too. The Android app allows for interaction with friends and has notification, something the Symbian app sadly lacks. Sports Tracker’s web portal maintains the same simple yet powerful feel as the app though it doesn’t actually bring much more addtional analysis. From the dashboard you immediately have access to global controls, your 10 most recent works, notification and links to the store, link to increase your friend base and to import workouts manually. My Workouts is the most interesting view on Sports Tracker’s website. The great aspect of Sports Tracker is cross platform compatibility, as I mentioned earlier, covering Symbian, Android, Windows Phone, MeeGo/Harmattan and iOS. The home page also has a snapshot of your lifetime stats, a newsfeed below the workout, coaching tips and more. At the top is a ribbon with drop down menus for accessing features. You can create new workouts from there, manage workouts and routes and the track section lets you view past workouts, stats and your shoes. The last one is pretty neat. On the website you can add your shoes to your profile and as you log workouts, by selecting which shoe you used, you can keep with how many miles you’ve done on each. Shoes typically last for 500-800km so this is a good way to keep up. You also have access to the blog and forums. At the top right corner is a drop down menu next to your username that lets you manage your profile, sharing, privacy, notifications and site wide notifictaions. The most important part of the website and why I suggested you start here is the training. I will describe this later but you get the maximum use out of miCoach when you create training plans with the website that get synced to the mobile client. The key here is to just explore away. I literally got lost there was so much to look at. miCoach maintains a similar UI between all platforms which is great. The Symbian client is built using Qt, so it’s keeping with the times. When first starting up the app, you are required to set a 4 number PIN code which thankfully can be turned off in settings. Then you need to log in to your miCoach account and download voice packs. I will talk about that later. 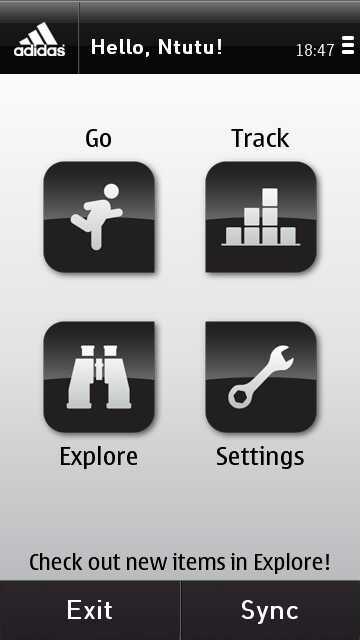 The landing page has four icons, Go, Track, Explore and Settings. The bottom toolbar is still of the old fashioned variety, deviating from Nokia Belle guidelines, with Exit and Sync buttons. The miCoach settings are rather extensive, covering everything from training paces (remember the key to miCoach is the coaching aspect of it), some toggles for in training settings etc. The Explore icon leads to what is basically a help section. I would advice anyone using the app for the first time to have a look through this section as it explains a lot about how miCoach works and what you should be getting out of it. The track section is where you will find your past workouts, milestones and shoe information. Lastly Go, where you initiate new workouts. As I’ve stressed, miCoach is a very extensive approach to the tracking excercise app, and is this is reflected immediately here. Before the workout starts you can choose music, activity and toggle coaching and GPS settings. 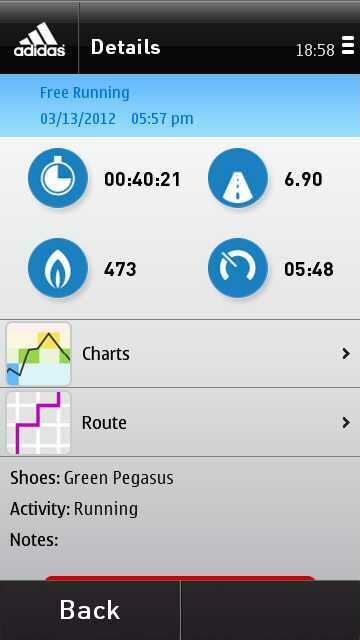 miCoach doesn’t let you begin a workout until a GPS signal is found which is smart. 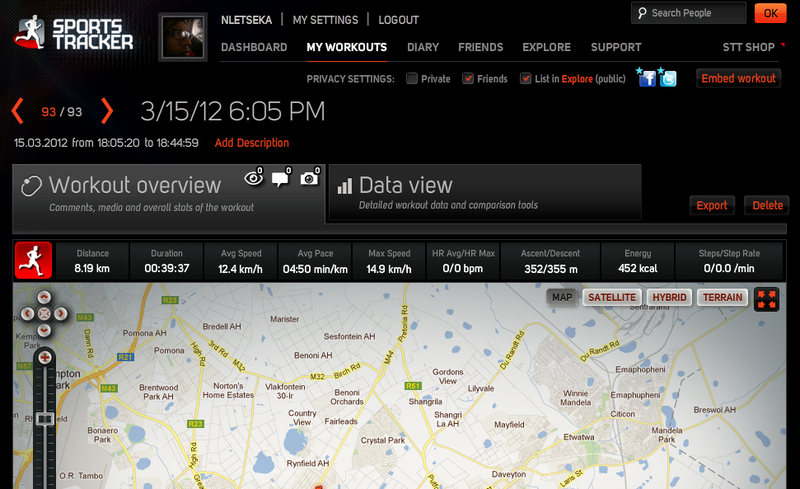 In exercise view you get a simple dashboard with time, distance tracked, calories burnt, and current pace. miCoach locks the workout screen. Since there are no additional screens to swipe through this is not a problem ad you only need to unlock the screen when you tracking. The workout overview, displayed after sending data accross to miCoach is more detail with maps view and charts view, where you will also find lap times, fixed at 1km splits . While miCoach has a nice app interface it is inferior to Sports Tracker. It does cover a nice spread of platforms, currently availbale on Symbian, Android, iOS and Blackberry. Endomondo has a relatively simple mobile app that is clearly designed to quickly capture data, give you something to look at after your workout but have the bulk of the analysing handled and viewed on the web. The Symbian app is by far the least feature rich out of all the ones I tested but this is unsurprising as development was ceased in December 2010. The Android apps come in regular and Pro flavours, the latter adding more workout options like time targets, beat yourself, and calorie target as well as the ability to view charts. Charts are not standalone like with miCoach and Sports Tracker but are overlayed onto the map view, in an interactive strip at the base of the map. 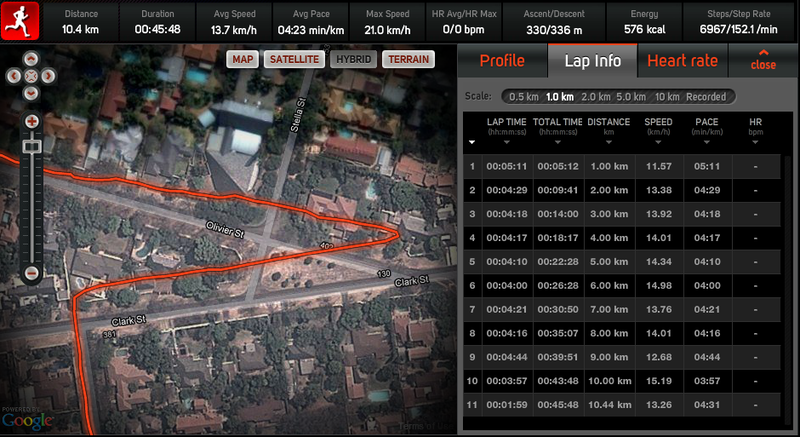 You also get a breakdown of laps in 1 km splits. The Summary page includes just the basic data, distance, time and some averages. 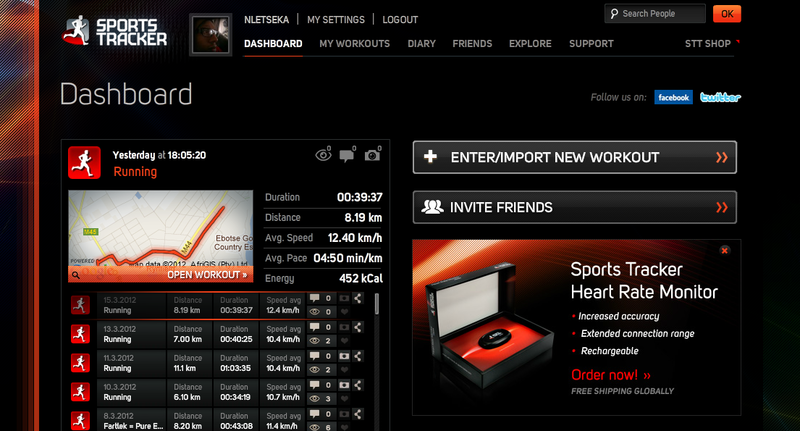 The workout dashboard is simple but good for at-a-glance information. There are four tracking zones that can be monitored, the image above showing duration, ditsnace, heart rate and speed in min/km. These zones can be changed by either a long hold or just tapping on the Symbian version. As expected, one can track a lot more zones on Android. The start and stop buttons are nice and big. I wish like wth miCoach and the Android version of Sports Tracker that you could lock the screen when running. 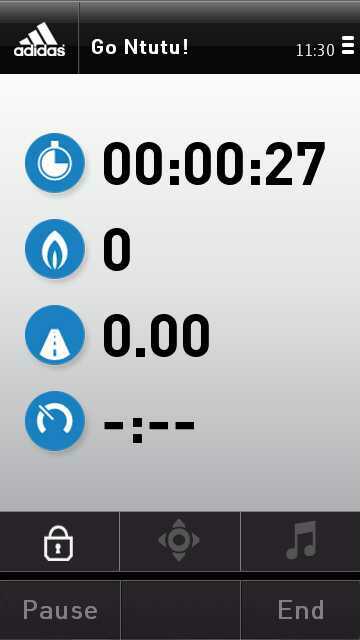 You can tweak some setting on the movile app, toggle audio settings, auto pause, set a countdown timer for before you run, and for pairing accesories. Challenging other Endomondo users...and falling very far behind! Endomondo also takes a novel approach to stats curation. It displays the usual stats you get with other services, total distance, hours etc, but adds in a bit of flavour to the mix. For example, all your workouts are trawled to present you with a Personal Bests table for various time and distance targets. It looks at the entire workout not just from the beginning, so your personal best for a 5km might be splits 10-15 in a 21.1 km workout. You can also specify when editing a workout which workouts to include in stats collection. There is also a weight and BMI tracker, which shows your most recent entry but you can get more details by going to the more detailed stats page. The sites does a stellar job in displaying the standard data expected, it’s really intuitive to use without any complications. Endomondo has a premium section to its service called the Athletes lounge, with monthly and annual packages at $6 and $39 respectively. These add what they call benchmarking, comparing your stats to friends and family, and a badge. The annual package comes with 15% off Endomondo gear and accessories. As of now Endomondo has several frozen or discotinued clients, Symbian, Windows Mobile and Java, and actively supports, Android, iOS, Blackberry and Windows Phone 7. 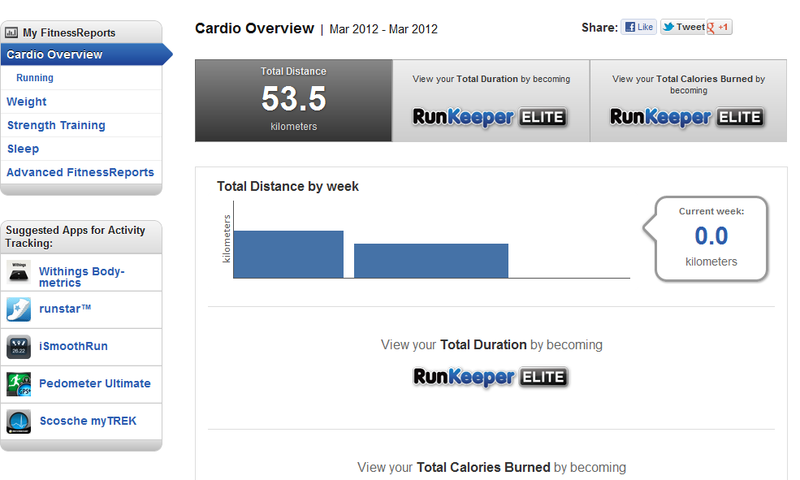 RunKeeper is probably the nicest looking of all the clients but as we know looks only count for part of the score. 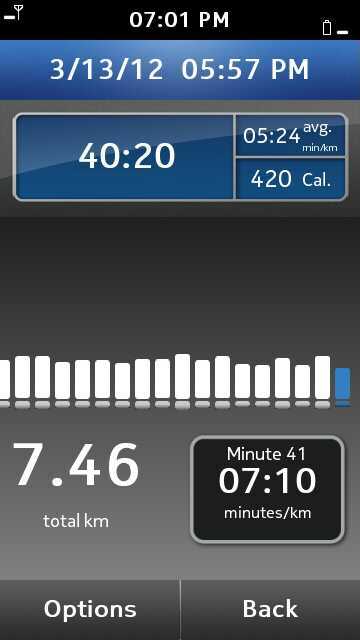 Cross platform compatibility is good, with RunKeeper being available for Symbian, with caveats, Android, Windows Phone 7 and iOS. Interestingly the service allows for other apps to link to RunKeeper via their Health Graph API and there is an extensive of (predominantly iOS) apps on the site. Like with miCoach the app is very consistent accross all platforms which is refreshing to see. When launching the app you are presented with the New Activity screen. 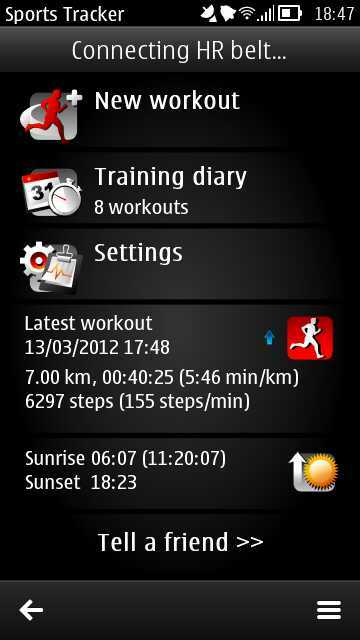 Additional views, like settings and past workouts are under options in Symbian, while the Android app makes use of tabs at the top of the screen. Initiating a workout is as easy as waiting for GPS signal and tapping start activity. You can choose different coaching types, routes and change activities should you wish. The in-workout and the workout summary views are virtually identical and this I have to say, at least for the summary makes RunKeeper the weakest out of the apps here. The top display shows total time, average speed for the whole workout and calories burnt. Beneath this you get a minute by minute graph, each drawn to scale I presume to show you your relative performance as you go along. I find this display type neither here nor there. In summary mode the exact same layout is preserved and you can scroll through the bar graph. Tapping on each bar gives you the relevant information associated with that data point. This is, like Endomondo, an app that is geared towards giving you quick at-a-glance information and redirecting you the website for more information and detailed analysis. I did mention caveats with RunKeeper. Unfortunately since upgrading to Nokia Belle, the app no longer works, crashing when I try to start a new workout. It was fine with Anna so clearly just a Belle incompatibility issue and one which I hope the developers fix soon, as pretty every review on the Nokia Store reflects this, with equally low score. And the website like the mobile app does just enough. I think part of it is that to unlock the full potential of the website, you need to become a RunKeeper Elite for $4.99/month or $19.99/year. Of course as I said, Endomondo that have a premium section to its site but you get a lot more from the open version than RunKeeper. Indeed, the Elite subscription provides similar features to Endomondo like the Pep Talk feature and more detailed analysis of your workouts. Your reports for example have most of the sections locked out. While there are clearly benefits to the elite membership, it is difficult to consider that as a value added service when other services offer similar for the price of nothing. Even something as trivial as showing total duration of workouts is locked out to elite members. It is just difficult to consider RunKeeper when as free services, others are providing much more comprehensive offerings and you need to drop some cash to, in some instances gain parity. Overall, RunKeeper does a decent job of the basics. The maps layouts are well done. The graphs could be better done, about on a par with Endomondo but not in the league of miCoach, never mind Sports Tracker. The service is just about par for the course for this category but unless I’m missing something, is not particularly special and doesn’t differentiate itself enough, or excel at the basic features. Beyond the basic functions of a sports tracking, service providers have included value added features to enhance and differentiate from the competition. Each service has a different palette of features. Something that impressed me about miCoach is its use of voice prompts and intergration with workout created on the websie with the mobile app. To be fair Endomondo had this feature to begin with but miCoach took it a step further. The coaching mechanism involves the use of pace based or HR monitor based coaching, using intensity zone. The zones are determined by a 12 minute run starting at a walking pace and ending with you going flat out. Four different pace or intensity zones are the computed and this form the basis of any workouts you set up on the website. A 30 minute tempo workout for example would involve five minutes at an easy pace to warm, blue zone and then 20 minutes at green zone, the next level up, followed by 5 minutes back at blue zone to cool down. For interval training, shorter intervals at yellow or red zones would be sandwiched between the blue zones. The key to getting this to work is the use of voice prompts. At each interval point the app will tell you exactly what needs to be achieved, for example ‘Speed up to Green Zone for 5 minutes’. The beauty of it is that you don’t need to remember the zone pace as the app will tell you if you go too fast or too slowly. The voice prompt also give you regular updates whether doing a predetermined workout or free workouts at each kilometre mark so you can track your progress. The coaching itself is interesting to say the least. I have been an on and off runner all my life basically and the last nine months or so have been the most consistent since I finished high school in 2001. When I started out I did the ‘plod along and just getting miles in my belt’ which got me great base line fitness but little else. I settled on a pace of 5:15/km which didn’t suit my goal of running sub 50 min for 10km. I was looking for more when I discovered the miCoach system and remarkably enough within four weeks I had reduced my 10km PM to 47:50 from 51:18. Then I suffered from burnout. miCoach uses a modern day principle of substituting long easy runs, the foundation of most training programs with shorter high intensity workouts. The jury is still out over what works best but I know for me, the miCoach system produced fast results by I just never had any recovery time and by December last year I was ready for a time-out! This type of workout style does work for a lot of people so it is worth giving it a trying. 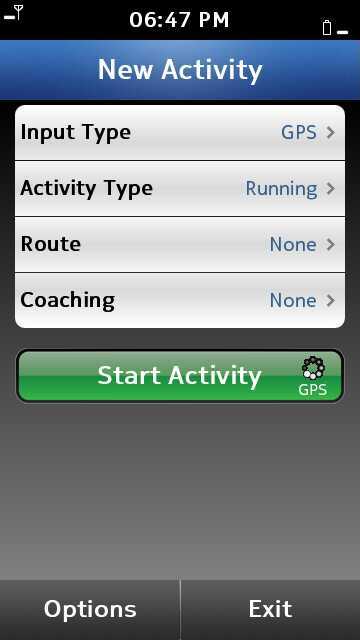 RunKeeper emulates the miCoach system of providing predefined coaching programmes that a user can subscribe to. These are however premium services that come at a cost. For regular users this is $19.99 and for Elite users it is $9.99. They don’t cover the same scope as miCoach targeting beginner runners and those just hit intermediate levels. The 10km plans for example go up to sub 55 min for example. 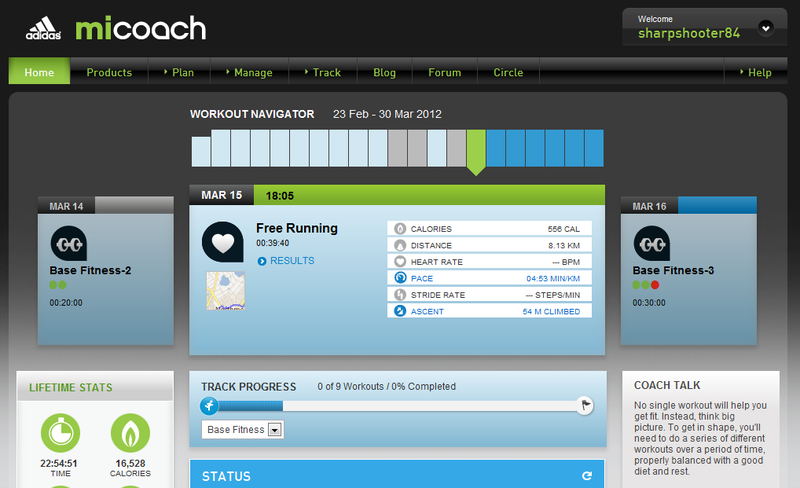 Like miCoach one can also set their own training plans but crucially this is done on the device. You have the choice of a basic taget pace workout, great for long runs or easy runs, or interval training. There are three predefined workouts but you can add to this. I was disappointed with two aspects however. First, for pace you have three options, slow, steady and fast, which are not informative at all. If you are running with a heat rate monitor for example that is fine, but what does something like steady even mean. Second, workouts created on device don’t seem to sync back to the server so will not show on other devices with RunKeeper installed. Voice feedback is pretty good here. You can specify what you want feedback on, distance, pace, calories heart rate, and you can also specify the frequency of the feedback. A step up on miCoach is that the feedback can be manually activated by tapping anywhere on the dashboard screen. Really slick and beautifully implemented. Edomondo has very basic coaching available. You can set just distance or time targets. In the Pro version of the apps, you can compete against friends or a previous workout. Voice Feeback is basic. You get 1km split feedback with time, pace and distance covered. If you have a target set, you get voice feedback on that aspect too. I used the distance target in my training and an additional bit of feedback you receive is the the estimated finish time on your workout which is based curiously on the last completed lap only. The key aspect of voice feedback which I was unable to test out is the pep talk where your friends can send you messages while you workout. Sports Tracker sadly offers zero value in this regard and leaves the training aspect to the user which in itself is not necessarily a bad thing. I think for experienced runners and for those just running for fitness or weight loss this is fine. There is a chasm of people in the middle for whom coaching is useful however. There are running clubs around with full time coaches of course but for soloists, being able to manage your training online and having it on the go is a real boon. The most basic thing one can do is to set another workout as a target, useful if doing the same route or another that is the same distance. All of these apps are designed to send workout data from device onto a central server in the cloud accessible via the website portals. This is all good and well, but I do feel that having some on the go information on hand is important. 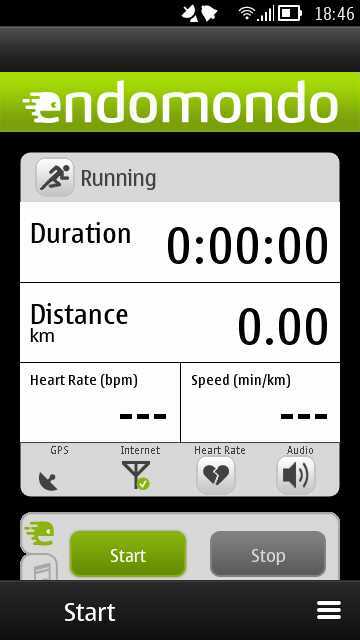 Sports Tracker introduced two way sync with their Android app and this extends to all other platforms except Symbian at this point. Endomondo is a curious case. All data is synced two ways except workout data, which is just bizarre to me. It is not enough to keep your workouts to yourself, broadcasting your progress and achievements to the world is par for the course in this socially connected world. In this case pretty much all these apps have this covered. What differs is the amount of control you have. Sports Tracker keeps things nice and simple, and flexible. Again you link your accounts on the website also just Facebook and Twitter. When you finish your workout, you can specify for each workout whether to keep it private, share to Sports Tracker friends or everyone, and specify which network to share to. It is a well thought out system. miCoach, as is the case with pretty much every aspect of the service is desktop orientated. Account linking is done in your account on the website and thereafter sharing to Twitter and Facebook is automated. You can filter out what gets posted and doesn’t. To avoid overwhelming followers and friends with ‘useless’ data like ho many burgers you burnt that evening, going through the type of information the app shares when it syncs is a good idea. RunKeeper and Endomondo sit somewhere in between. Endomondo seems to share automatically to Twitter if this service is selected but for Facebook you can tweak the setting in the app itself. RunKeper is the opposite where sharing to Facebook is automatic if the service is linked but Twitter sharing can be toggled in app settings. Friends on each service are as important as on your networks. All the services have support for friends allowing commenting on workouts etc but I feel RunKeeper does the best job, putting together what they call your Street Team. The ability to save routes is a nice feature that can be implemented. I have a couple of routes that I fall back on covering different distances allowing me to plan for the week where and when I’m going to be running, particularly on weekends. Sports Tracker is the only app that doesn’t allow for manual creation of routes. Instead what it does on the web site is that it can intelligently group workouts into routes. On the app itself, when following a route you can simply set an old workout as a target. Not elegant but it achieves the same thing. The remaining apps allow you to manually draw a route using the provided map view. Just search your location and get drawing! miCoach is the least intuitive design here. The seems to be no way to undo a route point so if you’ve marked a long way and make an error the only option I can find is to clear the route and start again! RunKeeper and Endomondo are streets ahead here. They both allow you to search for public routes. Creating routes is also a breeze, with crucially the ability to delete the last point. RunKeeper scores extra marks for two features. You can use an existing workout as a template to create a route, and you can snap the route to roads to minimize drawing errors. Heart Rate (HR) Monitors are supported by all the apps. miCoach is unique in that you have to use only Adidas branded monitors and it only works for the iPhone. RunKeeper supports monitors made by Polar and Wahoo, the latter adding support for the iPhone 4S but both compatible with all other bluetooth ready devices. Except Symbian devices. Go figure. Thankfully Endomondo and Sports Tracker support more devices. Endomondo is extensive, supporting Polar and Wahoo bluetooth monitors and any device with bluetooth. Garmin ANT+ monitors are also support which can pair with ANT+ enabled Sony Ericsson Android devices and pre 4S iPhone’s with the use of an additional €79.99 accessory. Sports Tracker supports the Polar bluetooth HR monitor as well as a rechargeable Sports Tracker branded monitor. The use of HR monitors is compatible with all devices except iPhones and Windows Phone devices. Exporting and importing workouts is an important feature that all except miCoach handle well, by that I mean non existent on miCoach. There are third party workarounds but this really should be built in from scratch. The rest are pretty similar, taking in gpx or kml files, but exported or imported one at a time. When I started this review/guide I thought it would be as simple as picking a few apps, taking them through their paces and delivering a judgement. Instead it has been an interesting journey of discovery and I my understanding of these apps and respect for the people who work on them has increased immensely. To quote my friend Quintin, “All we see is a simple app getting GPS co-ordinates and saving them. But actually, there a whole lot going on in the background.” A whole lot more than I bargained for. One of the aspects of Sports Tracking apps that I wanted to grapple with was how accurate they are. As a scientist by training we were taught to look all data from two perspectives, accuracy and precision. Accuracy is self-explanatory, how close you get to a ballpark figure in this case distance, but something not to be forgotten is the precision, or simply how reproducible the data is. When taking a lot of points into account the average might be your ball park figure but if there is a huge standard deviation, the precision will be off. Rather get 6.95 and 7.05 when aiming for 7 than getting 6.00 and 8.00! Once I began to understand how much effort goes into plotting a route accurately, I have changed my outlook for these apps and am for forgiving on the accuracy. I would like to know that the combination of the hardware and the apps algorithms are getting me close enough to my actual distance tracked but doing so with a high precision. I went through my archived workout data to find a route that I had done a few times. When I started running again in July last year, I had a route that I put together that was challenging enough but not too long that I would be stuffed come the end of the workout. I did this route a few time to gauge my baseline fitness before joining a club. 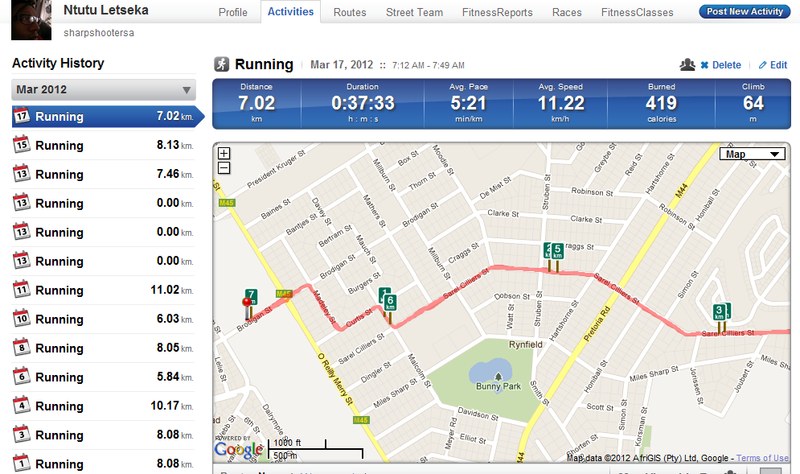 It is approximately 6km so I went back to look at over time what the app, in that case Sports Tracker had recorded. Over five sessions I recorded 6.10 km, 6.02 km, 6.02 km, 5.83 km and 5.90 km. As I showed earlier there was a 270 m variance when tracking the same route over the course of a few months using Sports Tracker. Interestingly though 270m doesn’t sound like much but even at my easy training pace it amounts to 1:30s and at my target race pace for the half marathon, 1:15s. Over a 6km route that is a variation of approximately 15s/km. To translate this into the real world, when I am doing a key training session like interval training which is short repeats on the track or on the road, or tempo runs where I am maintaining something approaching target race pace for 5-8km pacing is important. If the app is overestimating distance it is in effect telling me I am going faster than I actually am so I may end up undercooked, and the converse if it is underestimating distance it will report a slower pace and I might feel compelled to speed up to reach my ‘target’ pace. For experienced runners, feel is more of a guide than precise measurements than this but for someone like me overtraining or undertraining is a genuine possibility as I do not understand my body’s response that well. I at least feel now that I know this variation exists I use the tracking app as a guideline not as an absolute. For the majority of my training this past week, I found that Sports Tracker was a consistent outlier, always recording the furthest distance. The remaining three were usual clustered together with no more than 50 meters separating them. Overall though as long you accept that they are not absolute measures none deviated far enough from pre-measured routes to suggest any outrageous error. Looking at the actual apps themselves, I have always been reluctant to separate the mobile from the web portals and the two have to work in tandem. Clearly the web portal is not particularly useful on its own but equally the nature of a mobile device, particularly the relatively small screens even at 4.65” levels means that it is impractical to display all the information you get on the site. I genuinely believe that miCoach offers the most comprehensive solution out there right now and Adidas has to been commended for the sheer scope of what the services offers. From the humble beginnings of the concept that I first saw when using Sports Tracker as Nokia Beta Labs project, miCoach really pushes it to a whole new level. The magic is of course in the training component far beyond anything I’ve seen on a mobile. To give you an example, with half marathon training, miCoach has plans covering beginners aiming to just finish, and then targets ranging from 2:30 all the way down to elite times of 75 minutes! Add to that the cross training setups as well and it is just mind blowing. The app is sluggish on Symbian but runs beautifully on Android. It is not the most elegant it must be said, and I wish it allowed for more control on device but with everything together it is impressive. At the other end of the scale is Sports Tracker. I would class this as a no frills service. The mobile app, the newly designed one for Android is probably my favourite on device solution. More so than all the other apps I have tried it can act as a lone solution. The amount of detail you get on device is almost on a par with what you get on the website, and it is beautifully scaled down for mobile. All the information, splits, charts, heart rate and the map views, is implemented far better than any other app out there. The analysis is however at the basic level required for this sort of service and even online there is little extra. I do like for example that it can group workouts by routes allowing immediate comparison to previous workout. At the end of the day Sports Tracker is just a very well designed digital logbook. That is not a bad thing of course if that’s all you want out of the service and it does that better than anything else out there. What I do worry though is that if a user wants just a little bit more, they will be casting eyes elsewhere. For Symbian users the app does lack a bit more when compared to other services but I haven’t yet given up hope of an improved client with sync and voice feedback hitting the platform. The N9 app is prove that with the tools Nokia offers, elegant solutions can be made. RunKeeper shares the minimalist approach with Sports Tracker. The training packages are expensive I guess but if you join a club you still pay R500 ($60) plus so maybe $19 for a training program is not exorbitant. When I started using the app I fell in love with it immediately but niggles started to appear. I think it actually takes minimalism too far. The in-workout display is fine, I wanted to just glance at the screen and see key parameters, distance, time and pace, very quickly. And tapping the screen to get an implicit readout is great. But the workout summary really does nothing. The same basic data is displayed. The lone ‘chart’ is side scrobbale bar chart with minute by minute data. That’s not really informative in my opinion. I want distance splits which are far more useful for a workout. The website too is nothing to write home about, everything is there without ever impressing. In extended use RunKeeper was the least impressive. It’s difficult to say which I would choose. I don’t think I would choose one over the other based on the accuracy but now having done this exercise I know the limitations. I am unlikely to look at RunKeeper again as I really feel it does nothing particularly well. Sports Tracker is an old favourite but it really needs a feature bump as elegance alone cannot compensate for feature deficiency. I really like Endomondo but find the mobile app too basic, and as brilliant as the web portal is my primary usage is on mobile. Right now I will probably continue to use miCoach as my primary sports tracking service. One just cannot ignore the comprehensive feature set but I will certainly be keeping an eye on any further developments with Sports Tracker. As I get more experienced I will come to rely less and less on the coaching aspects of miCoach and as long as the Sports Tracker apps remain great I might be drawn back. Great write up! Really appreciate the depth you’ve gone into. I’m a casual runner myself, and use Sports Tracker mainly. I alternate between my long runs (up to 8 miles on a challenging course) and my interval runs. I do have miCoach, but never gave it too much of a work out. Based on this article, I will. I use my N8 in an armband for my runs. I think the size is perfect. I can’t see myself running with something the size of the Galaxy strapped to my arm! Jussi, I hope you guys give the Symbian version as much love as the others. A lot of us have been with you since the early days, don’t abandon us now! Very nice article! I also use sports tracker and have the HR belt as well. I will like to give miCoach a try simply for it’s coaching feature and I guess it also has encouragements to keep u going during your workout. I wonder if you can run both miCoach and Sportstracker at the same time. You most definitely can use them at the same time. While testing I was using all four at the same time! What an epic post, It’s rare to find people as enthusiastic for gps/sports apps now days, heh, I say now days, but they’re only really just starting to pick up in popularity ever since Nike+ came out, with a little help from Mapmyrun. Actually I’m suprised you haven’t mentioned MMR.. Personally I think it’s the best and it’s free, awesome statistics and web integration, they certainly impressed Nike that’s for sure. I followed you here from The Verge btw. My colleague uses Sports Tracker (on Nokia) and I use Endomondo (on Android) and I’ve been interested in our slightly different results when we’ve been out running together. Interestingly I appear to get avg time and pace quicker than him which I like. One thing I don’t like about the website is that it gives you a pace indicator for running (e.g 10 min/mile) but doesn’t give you the equivalent speed (e.g 6 mpg) even though the app gives you the speed but not the pace. Personally I’m more interested in the speed as it’s an easier number to remember and do comparisons with. As your summary mentions it’s hard to choose app over another and although my colleague has suggested I move over to Sports Tracker I’ve resisted as I have numerous friends on Endomondo, and even though we don’t really interact a great deal it’s interesting to see what they’ve been up to. Not to mention the several hundred workouts I’ve got logged! This may or may not be important (and I suspect all apps allow this) but you can swap between miles and km on Endomondo. I tend to use miles for my cycling and km for my running, but alas it’s a global setting I have to remember to change and ideally I’d like to be able to see the data in either format. But that’s probably because here in Britain we can’t decide if we want to be metric or imperial with our measurements! I’m interested in trying the miCoach though, as your description of it sounds ideal for improving my times and giving me more workout types to try rather than the standard plodding along approach. I’m hoping to get my 10km time down from my current PB of (just) sub-50 minutes, probably in 1 minute targets and I think miCoach could assist with that. Thanks for such a nice post! I discovered micoach and really like it and converted from sports-tracker(bugs me a bit because I bought the bluetooth HRM from ST). Have a problem though, on my N8 I never able to set a playlist. I only get all my songs randomly showing up. Some one else got this issue or maybe a solution? Sorry can’t really help there, I don’t ever run with music, I’ll have a look and see if I can replicate. Interesting write-up, I’ve been meaning to try ST on the N9 for ages. From what I’ve read in the past, it sounds like a really nice package. You’ve inspired me to hurry-up and try ST on my N9…. I’ll be vocal in getting them to improve things whenever I see limitations/flaws! Great write-up indeed, as I am currently looking for the best app and web service for running as well. Have you looked at Garmin Connect? I’m thinking of tracking with miCoach on the mobile, and then uploading the exported gpx (through runningfreeonline.com since miCoach doesn’t offer export…), and then uploading that to Garmin Connect. A bit cumbersome, but I like the Garmin Connect website. Hi, I’ve just started using Garmin Connect. It looks like it offers some good options. I haven’t had a chance to test it out yet, but just from reading that thread (& related links) you’ll learn that it’s a way more powerful/usable app, & becoming increasingly stable.